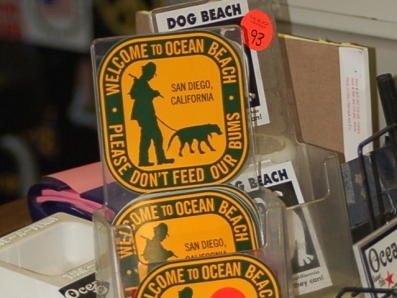 Ocean Beach has a longstanding reputation as a tolerant, freethinking community. But when it comes to rowdy drunks and druggies, the welcome mat is wearing thin. A message is being sent to all the well-meaning people who bring food to the homeless, by way of a sticker depicting the silhouette of an old-fashioned hobo walking a dog on a leash. This latest sign of the times in the eclectic community of 20,000 is showing up on windows of cars and stores, drawing nods of approval along with frowns from civil libertarians . “We have some transients who have been here forever, as long as I can remember, and they’re just part of the fabric of Ocean Beach,” said Denny Knox, executive director of the Ocean Beach Mainstreet Assn., which comprises some 440 businesses in O.B. A case in point is a running brawl among transients near the Ocean Beach pier on Labor Day , 2007, caught on home video by a local resident who can be heard wailing “Oh my God, what is with you? You guys are sick!” as she recorded the scenes. The “Don’t Feed Our Bums” message is aimed directly at Good Samaritans who serve the homeless food in various forms, and under conditions that don’t comply with county health laws — leaving trash behind, and more transients flocking to the area. Many in the so-called ‘Independent Republic of Ocean Beach’ say that perpetuates a disturbing cycle of dependency. “Certain scriptures, for example, say ‘He who does not work does not eat’,” said a guitar-playing Griffin Savard, during a break from practicing spiritual tunes on the seawall north of the Pier. There is some pushback to the anti-bums sentiment. A local blog is offering a free T-shirt to the person who peels off the most “Don’t Feed our Bums” stickers around town and sends them in.